Golden Crumpets at the show, with a great show bag to boot. There is plenty on at every Sydney Royal Easter Show event in order to keep us Sydney Food Lovers, or Sydney foodies entertained. First off, the Sydney wine and beer garden was a real crowd pleaser, and a pleasurable means of escape from the hustle and bustle of the show crowds, among an abundance of different foods to eat. This is all before stepping foot into the food pavilion, otherwise known as the Woolworths Fresh Food Dome. Of course, there was plenty of food to sample, from organic chips to pasta and slurpees to name. 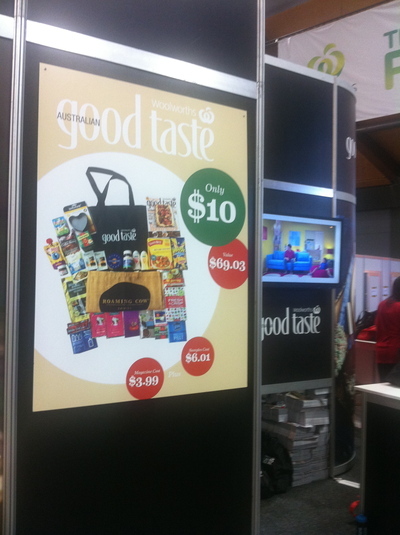 Sydney Food Lovers were able to buy some quality show bags at good prices, with value added items. First off, the $4 Cherry Ripe show bag was a great idea. There was just enough chocolate for energy while walking around at the show, with plenty of bars left for later. A number of bite sized Cherry Ripe, Boost and Dairy Milk bars were in this bag. About eight in all. However, the keepsake items were fantastic. Two quality Cherry Ripe pens in black ink makes $4 money well spent. However, the bags get better. The Good Taste and Food Ideas show bags had some great food samples, including some Madame Flavour tea, and some Nutella for pancakes, in tandem with an Adriano Zumbo cake mix. So cool Sydney. These two bags contain around $120 worth of value, mainly stocked with food items for only $15. 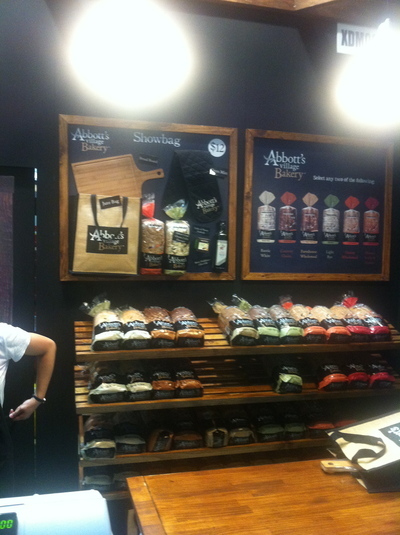 However, the show bags from Abbotts Village Bakery was a no-brainer. For only $12 (with $68 worth of value), two loaves of quality bread in addition to some quality kitchen equipment such as a solid chopping board and oven mitt to name were included. Highly recommended. having sampled their bread, it was divine. 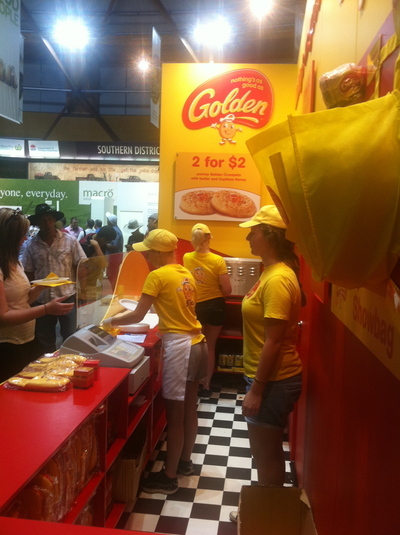 The Golden Crumpets bag contained similar value, more so in food items with the addition of a pair of Mr Golden Slippers at the 2013 show. Another great show bag, Good Taste. A hit with Sydney Food Lovers. 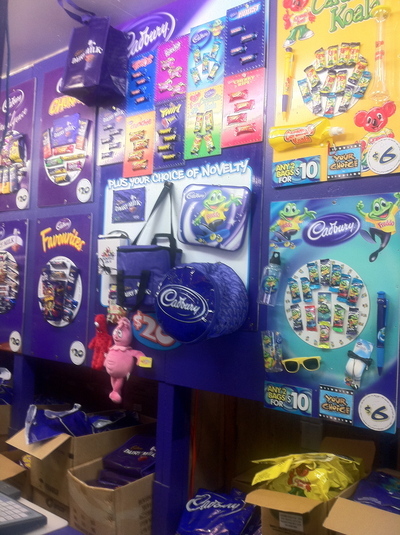 Sydney Food Lovers, the Easter Show is not just about kids and animals. There is also plenty of food sampling and tasting for Sydney Food Lovers. Wine and oysters at the show anyone? Yes please. Another crowd pleaser. Where: Food pavillion (Woolworths Fresh Food Dome) at the annual Sydney Royal Easter Show. When: Once a year just before and after Easter. Good for kids: Yes, although some of the foods are for the more mature tastes.